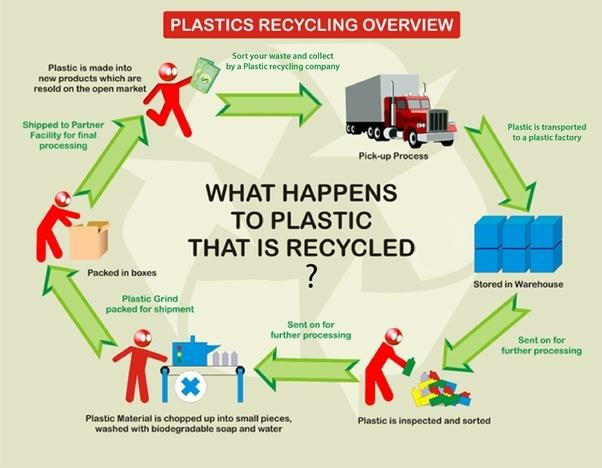 The diagram shows the process by which plastic is recycled. The diagram illustrates the process by which plastic is recycled for resale and use on the open market. Overall, there are six steps beginning with picking up the plastic to be recycled and ending with reformation into new goods and sale. At the start, waste is separated into its different types, and the plastic component picked up, and subsequently removed by truck to a plastic factory for storage and processing. After being stored in a warehouse for some time, the plastic is inspected by hand, and further sorted and graded in preparation for the next stage. Following inspection and sorting, the plastic is graded into tiny pieces in a chopping machine and cleaned using environmentally friendly soap and water. The resulting material is now known as plastic grind which is then packaged in boxes and dispatched to a partner facility where it is formed into new products. These in turn will be sold to consumers. Give the number of stages or steps. State the range of key activities at the beginning and end of the process. This diagram has a lot of information, so it’s important to highlight the key information only. Key processes are sorting, pickup, storage, “further processing,” inspection, chopping, washing, packing, shipping, usage in production of new items. The first sentence summarizes the first three processes. Sequence words such as “subsequently” and “after” help to show the order of actions. “Further” means “more” since sorting was already done at the start of the process. When showing the transition from step to step, use introduction signposting phrases that state that the previous process has been completed. For example, “After inspection is completed, the plastic is sent to the chopping machine” is better than “Later, the plastic is sent to the chopping machine.” Demonstrative pronouns like “Following this” can also be used. Use synonyms for “biodegradable soap” such as “environmentally friendly soap.” Think about this in your plan beforehand. Define the new term of “plastic grind” and summarize the last part of the process. The diagram illustrate the process by which plastic recycled for resale and use on the open market. Generally, there are six step beginning with picking up plastic to recycled and ending with reformating into new goods and sale. At the start, waste is separation into its different types, and the plastic component picked up, and subsequently remove by truck to a plastic factory for storage and processing. After being stored in a warehouse for some time, the plastic is inspected hand, and further sort and graded preparation for next stage. Following inspection and sorting, the plastic is grade into tiny pieces in chopping machine and cleaning using environmentally friendly soap and water. The resulting material is now known plastic grind which are then packaging in box and dispatch to a partner facility where it is formed into new products. These in turn will be sold to consumer.